As a child in Bishop, Texas, Frank Garcia learned many valuable lessons from his father, born in Mexico, and from his mother, born in Texas, who valued hard work, pride in being an American citizen, thankfulness for the daily gifts of life, and the importance of helping others. Moving to southern California in 1961, Garcia founded several restaurants including La Casa Garcia Restaurant in Anaheim in 1973, which soon became a leading Orange County restaurant through the dedicated commitment of Frank, his wife Silvia, and their children, Frank, Jr., Johnny, Cindy, Veronica, and Silvia. 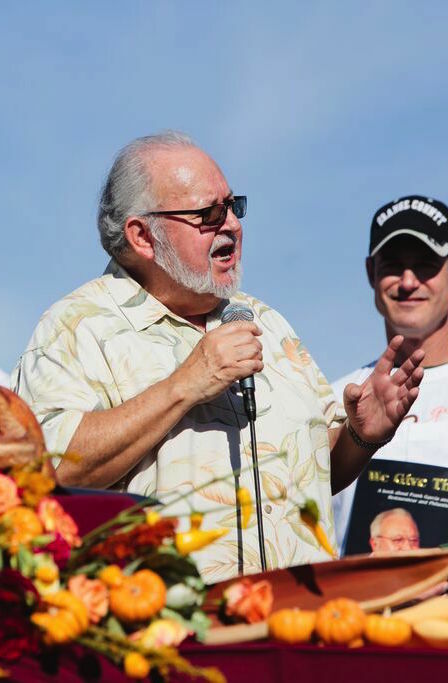 The childhood lessons Garcia learned instilled a sense of community, a need to give to others, and the inspiration to establish We Give Thanks Inc., a nonprofit corporation, which has served free Thanksgiving dinners to Southern Californians in need for nearly two decades—to date, more than 200,000 meals. In 2001, We Give Thanks established an annual Women of Vision Awards Dinner in memory of his mother to recognize women with exceptional commitments to community service. Proceeds from this event benefit the We Give Thanks Scholarship Program, which assists local students in need. In 2005, Garcia traveled to Corpus Christi, Texas after Hurricane Katrina to serve tens of thousands of hot meals to evacuees. We Give Thanks has also served orphanages in Tijuana, Mexico, distributing food, toys, computers, and school supplies. Frank Garcia is committed to serving persons in need with compassion and instilling the spirit of giving to others.